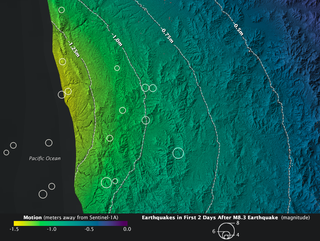 The Illapel earthquake that hit Chile in September shifted the ground by up to 1.4 meters. That’s awfully far to move the not-so-steady rock below our feet. A magnitude 8.3 earthquake hit Chile on September 16, 2015. The sudden snapping and release of tension in the tectonic plates shifted the very ground, with the greatest displacement close to the epicenter along the country’s coast. This new map uses the same synthetic aperture radar data from the European Space Agency’s Copernicus Sentinel-1A satellite that we looked at in the days after the earthquake, but cleaned up to show ground displacement more clearly. The ground moved vertically, horizontally, or a combination of both. The ground displacement is measured by looking at the interference pattern between before and after measurements by the satellite’s radar. Fantastically, the 1.4 meter maximum displacement in this new map confirms with the initial displacement estimated from counting fringes on the interferogram. The ground shifted most in areas marked yellow (up to 1.4 meters), running down through green and blue until marking the areas of no displacement (0 meters) in purple. The circles mark out the epicenters of earthquakes, with circle diameter tied to earthquake magnitude. Radar can see at night and through clouds, but not through water so we can’t see any displacement along the ocean floor. The earthquake also triggered a 4.5 meter tsunami that inundated the coast near Coquimbo, which suggests that the seafloor also deformed, possibly even more than the land.